Women in their 40s are commonly aware that their fertility will not last forever. 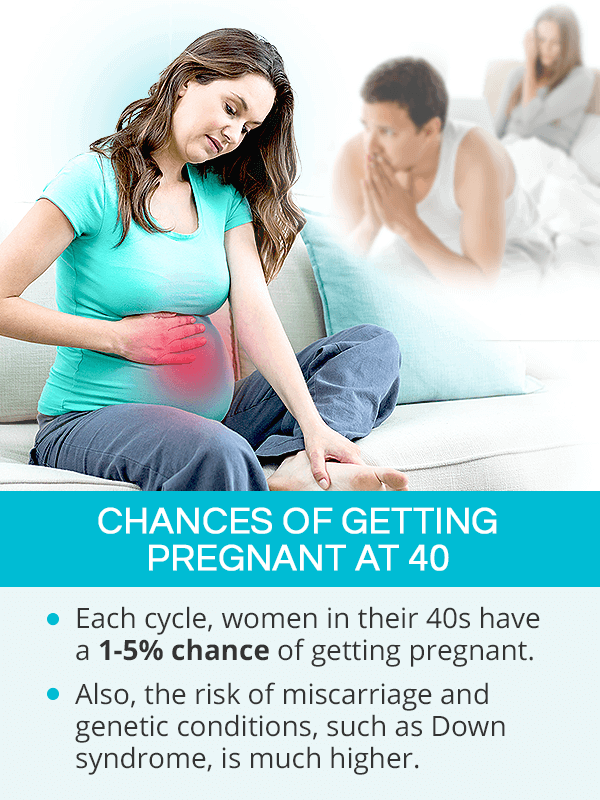 Consequently, many search means to evaluate their chances of getting pregnant after 40 before they go into menopause. Because eventual fertility loss is an inevitable part of womanhood, it is imperative for women to understand how fertility changes with age so that they are empowered to make the best decisions about their reproductive life. Keep on reading for a better understanding of fertility over 40 so that you have all the necessary tools at your disposal to make the most out of your chances of becoming a mother. 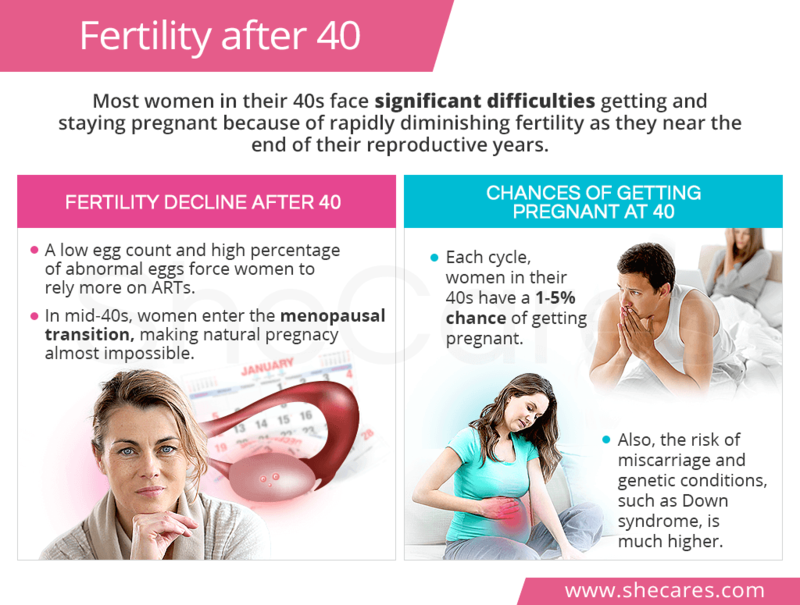 What Affects Fertility after 40? Although fertility already begins to decline at faster rates at the age of 35, turning 40 comes with new reproductive challenges, the main of which is the approaching menopause. The average age of menopause, when a woman's ability to get pregnant is virtually over, is 51. However, menopause is preceded by a phase called perimenopause. It usually begins in the mid-40s and can span over two to 10 years. It is the time during which the most notorious menopause symptoms occur, including those that can complicate conception efforts like irregular periods or loss of libido. Fertility decline after 40 is tied to the naturally windling ovarian reserve throughout a woman's life, which has two key components, egg count and quality. Egg count, or quantity, refers to the number of eggs in the ovaries. It declines at various rates from roughly 1-2 million eggs at birth until it reaches total depletion at menopause. How Many Eggs Does a Woman Have at 40? Anti-Müllerian Hormone (AMH) blood test can give insight of the number of eggs maturing in the ovaries in a given menstrual cycle. Normal AMH levels for 40-year-old women are 1.3 ng/mL. Likewise, for those aged 43 and older, they drop to 0.7 - 0.5 ng/mL. Antral follicle count is an ultrasound that allows for the view of maturing follicles inside the ovary in a menstrual cycle. For women after 40, a normal egg count is eight follicles. Then, for those after 45, the count of six follicles is within the norm. Egg quality refers to the DNA composition of the eggs that determine whether they progress into a healthy pregnancy. There are no tests that can determine egg quality. Based on the rates of fertility and pregnancy loss among women over 40, it is projected the majority of eggs have genetic abnormalities. When an egg with abnormal DNA is released on ovulation, it might fail to become fertilized or implant in the uterine wall. Moreover, it might lead to pregnancy complications, like miscarriage, stillbirth, or birth defects. As a result, it tends to take longer for women over 40 to conceive naturally. On average, a woman's chances of getting pregnant after 40 in any given menstrual cycle are 5% and 1-3% after she turns 45. For comparison, a woman in her 20s has a 25% chance of getting pregnant, which is the highest among all age groups. A natural pregnancy at 40 is still feasible for many women. But because of the declining ovarian reserve, it often takes longer to get pregnant, and it is harder to stay pregnant. Because about 80% of eggs have DNA changes, miscarriage rates (34%) and the risk of birth defects are high. 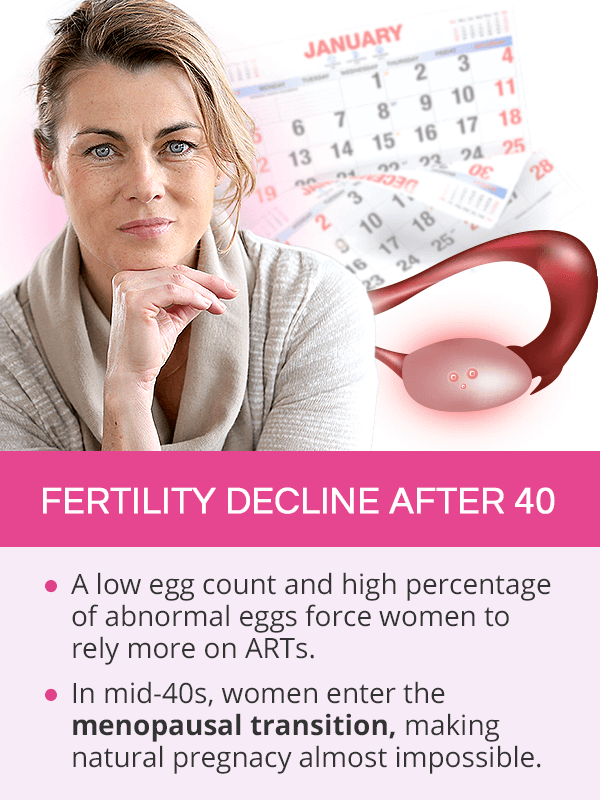 Less than 40% of women in their early 40s will conceive after a year of trying. As a result, assisted reproductive technologies (ART) become a common approach. Around the time a woman is in her mid-40s, she most likely enters the menopausal transition and conceiving with her own eggs is generally impossible. Consequently, 53% of pregnancies will result in a miscarriage, and 1 in 30 babies to mothers aged 45 will have genetic defects, such as Down syndrome. By age 49, the risk of genetic defects increases to 1 in 10 babies. The best recommendation for women searching to get pregnant is to act quickly. Since fertility over 40 declines with every passing year, making a comprehensive and pro-active plan is key to success. Scheduling a consultation with the OBGYN to explore all possible reproductive options is the first step. Most commonly, the doctor will order a variety of tests to evaluate the state of a woman's ovarian reserve and hormone levels. The next steps will differ woman to woman, depending on her exact age and health status as well as the length of time spent trying to conceive. In the early 40s, many women will be encouraged to try to conceive naturally for several months. Those over45 will be recommended ARTs right away. Efforts will typically be focused on boosting conception chances and regulating hormones naturally or with medications. Natural approaches include lifestyle habits, such as a fertility diet and exercise for proper nutrition and optimal weight, or natural supplements, including those containing phytoestrogens, like black cohosh or red clover, or hormone-regulating supplements, like Macafem. Conventional approaches to inducing ovulation or treating infertility might be taken into consideration if pregnancy is not achieved within a few months. They might include fertility pills and injections or surgery to achieve hormonal balance and improve ovulation faster. However, studies have shown that a woman's age affects the effectiveness of ARTs. Women over 40 undergoing IVF with their own eggs have much lower rates of success and might require more cycles of IVF to conceive. Therefore, for those in their mid-40s or older, getting pregnant with eggs from a younger donor could prove more successful. Some women in their early 40s are considering undergoing fertility preservation, such as freezing eggs or ovarian transposition. In most cases, this decision is due to their health condition that requires treatment that is known to negatively affect fertility, such as radiation or chemotherapy for cancer. Although there is no official age limit for freezing eggs or performing IVF, many clinics have their own policies regarding advanced maternal age. Since age is the most important factor affecting women's chances of pregnancy, fertility after 40 tends to suffer significant blows. Because women are about to enter the menopausal transition, this further complicates getting or staying pregnant due to a decreasing number of eggs and an increasing percentage of DNA changes within them. However, with prompt and proactive approaches, women can still make the most out of their chances of getting pregnant after 40. Fertility-boosting practices might include keeping a nutritious diet and herbal supplements for hormonal balance, like Macafem, or medications for ovulation stimulation. Alternatively, they can partake in take of medical advancements, such as IVF, to realize their dream of becoming a mother.